We recreated one of the most iconic and well know marches in Indian history, as a homage to the brave souls who were a part of it. “Here was this all important moment in history, and almost no one can even recall its participants. Perhaps this memorial will help change that”- quoted a researcher who met the existing families of all those who undertook a journey of almost 400 kilometers on foot to kick start a fresh round of the Civil Disobedience Movement in 1930. It was on April 6th 1930, when Gandhi lifted a lump of salt and uttered the famous words, “with this I am shaking the foundations of the British empire,” that eighty other people from different communities and regions of the country stood by him. 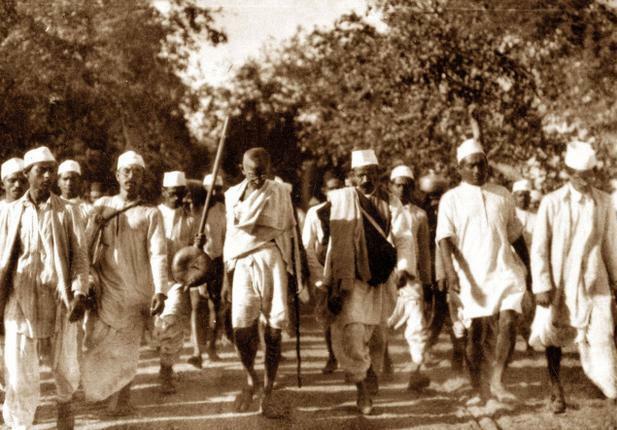 Little is known about the other marchers who were handpicked by Gandhi himself for this act of non-violent protest against the Salt tax imposed by the British India Company. Though the move was not the first of its kind, it gained quite a good momentum amongst the people of villages the marchers crossed. Eighty five years since they undertook the journey, Dandi is no more than a beach let alone the foundation of a historic milestone. 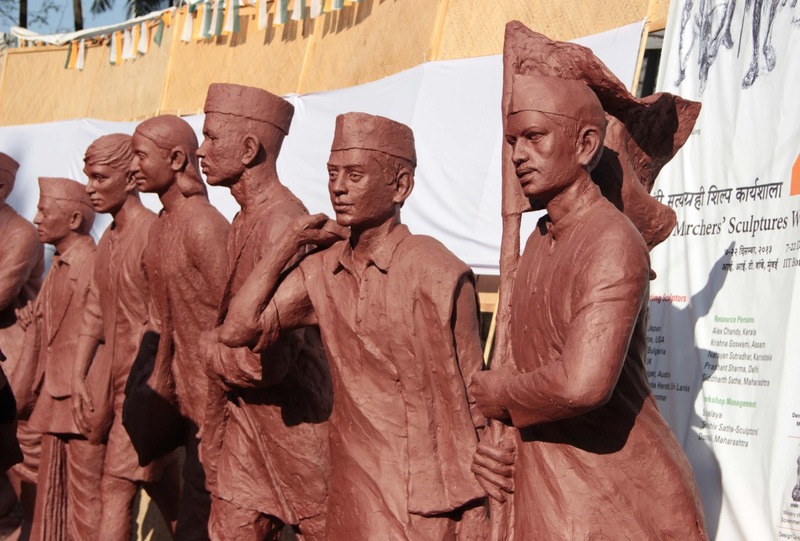 With one of the most famous sites in the freedom struggle of India having fallen out of national consciousness, the Ministry of Culture (MoC) proposed a national memorial dedicated to the Dandi March, to be set up at Dandi. The Dandi Salt Satyagraha Memorial is a project of the MoC, India, coordinated and implemented by IIT Bombay in association with the International Design Team. Though the project was announced in 2005 by the then Prime Minister of India Shri Manmohan Singh to commemorate the 75th anniversary of the Dandi March, the design was finally approved in 2014, and then flagged off. Industrial Design Centre (IDC) of IIT Bombay has been coordinating the research, design visualization, and the creation of art components for the project. 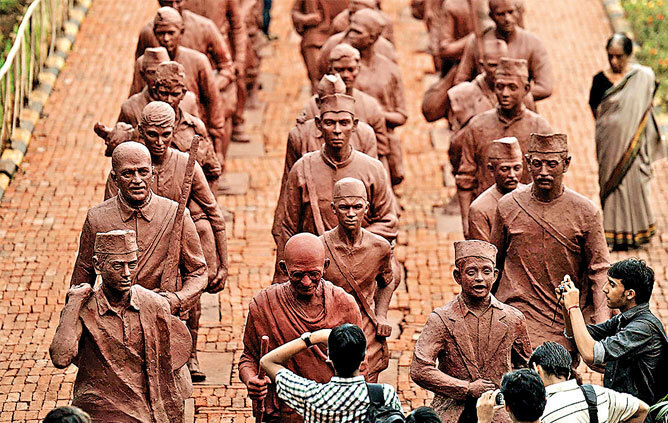 The unique event saw sculptors coming together from different parts of not only the country but from across the globe to create life-sizesculptures of all the eighty people who were a part of the ‘March’. When commemorating such an important event in the history of India, Imaginarium takes pride in having being associated with the project. 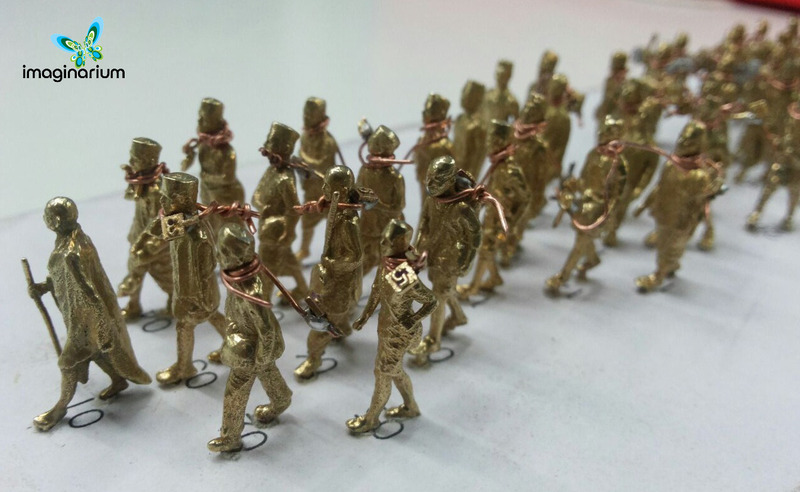 The responsibilities involved “printing” statues of all 80 marchers in different sizes and materials, to be used as a memento, or placed in the museums dedicated to the ‘March’. The procedure involved high resolution 3D scanning of elbow sized sculptures of all the eighty marchers, also used as a reference model to sculpt life-size statues. 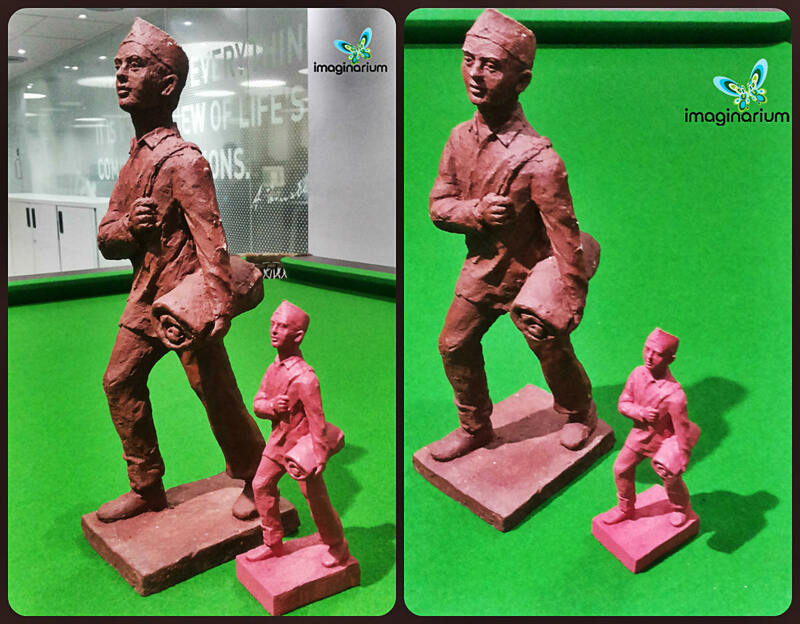 The scanned data was then used in remodeling of the statues, helping in miniaturizing them. Each file was to be repaired for water tightness, build quality, and resolution. 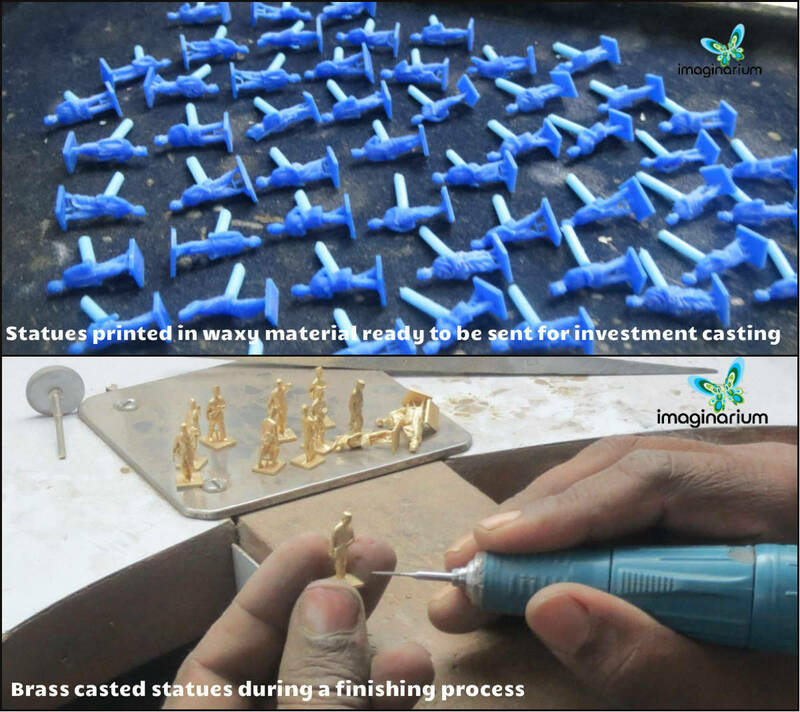 Having being printed in a wax like resin material, the miniaturized statues were casted in Brass through investment casting method, with metallic painting as a finishing material. 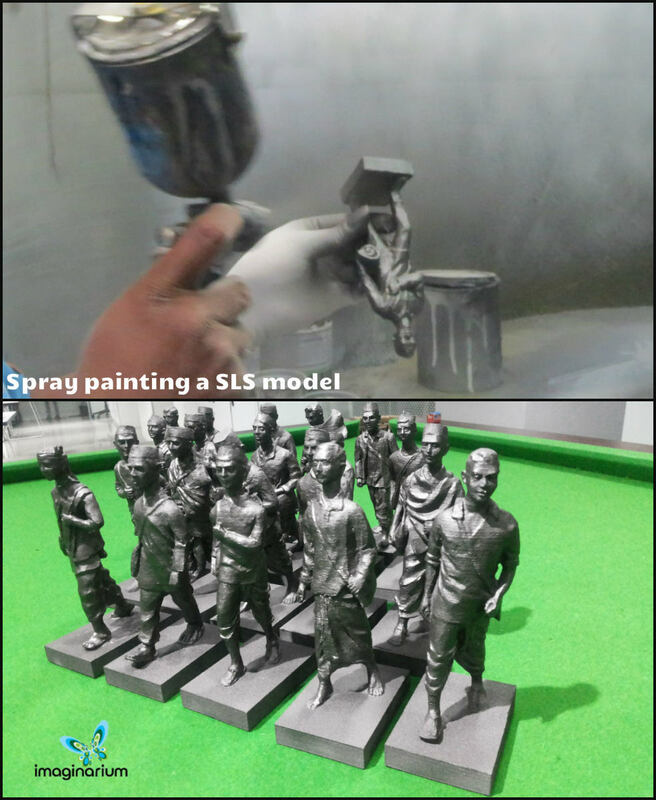 For the statues that would to be used as mementos, CAD models were made as small as ten centimeters, and sent for printing using SLS technology. Spray painting was the finishing point. Imaginarium’s involvement demonstrates how 3D printing can help create artefacts in any size and holds a good potential for restorations in archaeology. The main memorial which is to include a statue of Gandhi below a pyramid of light, followed by life-size sculptures of the group of 80 fellow marchers, will be built at Saifee Villa, the house in Dandi where Gandhi stayed till the end of ‘March’. The hands of sculpture would be raised upwards holding a handful of artificial salt crystals, and would have solar panels embedded within them with a bank of LED search lights floor mounted around the rim of the base pedestal. The arrangement resembles illuminati, wherein with the light levels going down during dusk, a pyramid of light rises up in the sky incandescing the salt crystals at the apex. A pathway leading to the main memorial is to be built, which will replicate the ‘March’ route, through 24 spaces representing the 24 halts. Each space will have a panel carrying a visual depiction of the main events which occurred during the day’s journey to the halt. The memorial portal describes it as an experiential way to recreate the spirit and journey of Dandi March, and a means to know the unknown fighters who accompanied Gandhi on the March.